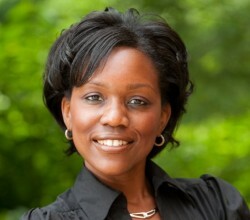 Trachette L. Jackson is Full Professor in the Mathematics Department, who specializes in Computational Cancer Research or Mathematical Oncology. A focus of Dr. Jackson’s research has been achieving a unified understanding of how signaling molecules, cells, and micro-environmental structures coordinate to control blood vessel generation, morphology and functionality during tumor growth. Her work aims to biochemically and biomechanically characterize the collective motion vascular endothelial cells, one of most important cell types involved in cancer development due to their role in angiogenesis. With an eye toward addressing critical challenges associated with targeted molecular therapeutics, for example determining which drugs are the best candidates for clinical trials, Dr. Jackson also develops multiscale mathematical models that are designed to optimize the use of targeted drug treatment strategies. These mathematical models connect the molecular events associated with tumor growth and angiogenesis with the temporal changes in tumor cell and endothelial cell proliferation, migration and survival, and link these dynamics to tumor growth, vascular composition, and therapeutic outcome.